Welcome to Cindy's Crochet Pages! I collect patterns, yarn, thread, and unfinished projects, but have very few crochet items that I've made and kept for myself. Almost everything I make is given away as some sort of gift. But that is what I love most about crochet -- making things for the people I love. My list of "To Do's" is nearly as long as the list of things I've "Done", and there never seems to be enough time to get to all of them. I like to crochet with both yarn and thread, and have even tried a hand at several other things like cording, fabric, etc. My favorite things to make are household items and wardrobe accessories. No poodle toilet paper covers here! I try very hard to make sure everything I make is fashionable and trendy, or very classic. I also make a few novelty theme items such as pillows and afghans featuring favorite sports teams, etc. Great add-ons for gift baskets! Beautiful handmade soaps, wonderfully scented bath salts, craft retreats and cruises, scrapbooking supplies, and a whole lot more! Check out our 5-Night Western Caribbean Cruise scheduled for September 2010! Designing is another of my passions for crochet. I have several original patterns which I hope to include on this site in the near future. Household items, baby blankets, motifs, and much more are available for download here. I've fielded quite a few questions about the afghan stitch over the years. It's one of my favorite stitches. It's quite versatile, very simple to do, and it is perfectly suited to charted graph patterns. Since it's so hard to explain to people without the use of pictures, I decided to put together a brief tutorial on how to make color changes and some other neat things you can do with the afghan stitch. This tutorial does not contain instructions on how to do the basic stitch, since someone else already has a great site all about that. (See Tunisian Crochet (Afghan Stitch) Tutorials ) Rather, I wanted to demonstrate how easy it is to do more than just cross-stitch over this plain but useful fabric. I also get a lot of requests for patterns utilizing the afghan stitch. Here are a few suggestions. Dave the "Crochet man" maintains Serendipity Crochet, a site devoted to afghan stitch sweaters and other great ideas. Judy Mitchell designs beautiful afghans at Designs by J.A.M.I. You might also try simple cross-stitch patterns or find a graphic you like and apply it to graph paper to create your own! I've had a lot of fun designing charts for afghan stitch, maybe you will, too! One of my ongoing projects has been a series of sofa pillows in a NASCAR Winston Cup theme. Our whole family is into this growing sport, and I have been decorating my den/rec. room in this theme, so pillows for each of our favorite drivers were a must. These are all original designs which I would be more than happy to share! I have patterns for several different drivers/teams, and plan to add more as time will allow. You may view/download these patterns by clicking on the pillows below. Another of my projects was to design a NASCAR afghan for my husband. His favorite driver is Rusty Wallace, so I designed this special afghan just for him. Just click on the graphic below. Please keep in mind that these are original patterns I designed myself, so all copyright laws apply. Also, if you download one of the patterns, please drop me an email! I'd love to hear from you, and it will help me keep track of which patterns are the most popular! If you don't email, I might think no one's interested, and then I won't bother to create more. If you're like me, you've probably got lots of patterns and yarn lying around in stacks and piles everywhere, stuffed in every available space, and otherwise taking up way too much space. My collection got so large that I couldn't find anything when I needed it. In the summer of 1999, I resolved to get it all organized. One solution was some handy little magazine files made out of plastic canvas. Jennie Gaskin of Country Yarns came up with the original holder, which is perfectly sized to fit those smaller magazines like "The Workbasket" and "Crochet Digest". Using Jennie's idea, I came up with the larger version, which is suitable for everything from "Crochet with Heart" to "Leisure Arts" leaflets. I also have some great ideas for yarn storage, as well as a lot of other little goodies for that expanding collection of "stuff". This is my little show-off section where I get to display some of the projects I've worked on in the last few years. Most of these items use published patterns, which I'm sorry to say I cannot share. However, for those who may be interested, I have included information about the source of the pattern to assist you in locating one. Please do not email me if you cannot locate the pattern, as I will not be able to provide you a copy. 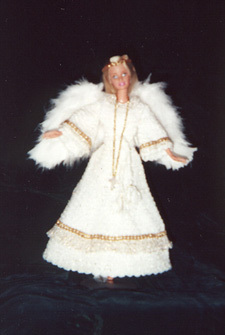 This is the Barbie angel costume I made for my niece for Christmas one year. I didn't get the photos developed until after Christmas, and it was too late to take a better picture. Sorry. This pattern came from Hooked on Crochet, Issue #72. I didn't like the wing design featured in the magazine, so I made my own. Also, I did something a little different with the halo because I used a real Barbie instead of the 11 1/2"craft doll featured. One tip, I think this pattern would fit an older Barbie better than the new ones which have a different chest size. 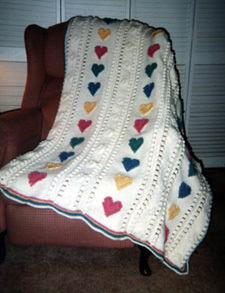 In November 1997, I stumbled upon a wonderful web site and email list called Crochet Partners. The site itself is a MUST SEE for any crocheter. You can find patterns, links, a great resource list, a chat room, exchanges, and much more. They also have a great email discussion group that has really revived my interest in crochet and has challenged me to try a lot of new things. I really have learned a lot from them. A while back, someone told me about The Hook and the Book, an online virtual exhibit featuring the history of knit and crochet in America. A "must see" for anyone who is interested in the origins of crochet and heirlooms! Hope you enjoyed my web site! Come back again and watch for new patterns. To request patterns or comment on this web site, email me!